The participation fee covers local housing during the project, three vegetarian meals a day, ground transportation to and from the airport and project site, local excursions, short-term travel insurance, a Maranatha t-shirt, and luggage tags. Flights, passports, entrance visas, and vaccinations are not included in the participation fee. This project has an optional excursion available for an additional cost of $425. See below for more information. Project participation fees are tax-deductible; excursion fee are not. Children 12 and under have a discount of $150. All prices are listed in US dollars. Join Maranatha in the beautiful country of Brazil! Volunteers in this group will be working in a suburb of the city of Sao Paulo called Franco da Rocha. The Parque Paulista church currently has 50 members and they’ve been adding to their numbers! But they currently meet in a small storefront and they can’t continue to grow because of the lack of space. The members have been focused on building a new church and have been saving money. They recently purchased property about two blocks from their rented location and will be a great location for this thriving congregation. Volunteers on this project will be building a new church for the Parque Paulista church and depending on the number of volunteers register, may also reach out into the surrounding community through outreach projects and children’s ministry programs. ARRIVALVolunteers will arrive in Sao Paulo Brazil (airport code GRU) on Thursday, January 24, 2019. Please wait for confirmation from Maranatha before purchasing your airfare to ensure there is still space on the project. DEPARTUREVolunteers will depart from Sao Paulo (GRU) on Sunday, February 3, 2019 or continue on the optional excursion. Those on the optional excursion will depart from Sao Paulo (GRU) on Tuesday, February 5, 2019 in the late evening. During the project, volunteers will stay at Hotel Classic in Franco Da Rocha. The hotel is about an hour and a half from the airport in São Paulo, so the group will travel directly to the hotel when they arrive on the 24th. The hotel is small and basic, between a 1 and 2-star facility, depending on how you rate hotels. We chose this level because it is adequate, safe, and clean, and it keeps the participation fee manageable for families. We mention this in advance so you can adjust your expectations for the mission trip. The hotel provides clean bedding and towels, private bathrooms, and instant hot water heater showers. We recommend that you bring your own washcloths as they are not commonly provided in Brazil. All the rooms have overhead ceiling fans and Wi-Fi, but at slower connection speeds than common at home. The hotel is located right on main street in a gated parking lot area, so there isn’t a lot of space around the hotel. the group will meet together for meals and worship in a small dining room. Each day, the group will travel by private transportation to the job site, which is about 15 minutes away. Most of the rooms are double and triple occupancy, so volunteers should plan on staying with one or two other volunteers. We divide the volunteers based by gender and then age, but if you would like to room with someonein particular, please let us know prior to the final deadline of the project. During the project, there may be some single occupancy rooms available for an extra cost. Volunteers will purchase their own plane tickets and from Brazil. The dates posted are the arrival and departure dates from the project, but due to travel time, you may need to leave a day or two before the arrival date. Maranatha representatives will meet volunteers upon arrival in Sao Paulo. Please wait for confirmation before purchasing your airfare to ensure that there is enough space on the project. More information including arrival and departure time windows is available in an information packet available for download above. Booking outside these windows could result in additional fees and missed portions of the project. At the end of the project volunteers can choose to extend their stay in Brazil by joining an optional excursion to the world famious, Iguazu Falls. This excursion has an additional fee of $425, which will cover all hotels, meals, ground transportation, entrance fees, tour guides, and insurance during the excursion days. The fee does not cover the domestic flight from Sao Paulo to Foz do Iguaçu on February 3. Volunteers will be responsible for booking their own domestic flight. Details on the exact flight to book ate listed in the travel information section of the information packet. On Sunday, those staying on for excursion will travel by plane to Foz do Iguaçu where they’ll start their tour. Iguazu Falls is located on the Brazil-Argentina border. It is said that from Brazil you “see” the falls and from Argentina you “live” the falls, and visitors on this tour will get to enjoy the falls from both sides of the border. Iguazu comes from two Guarani words meaning “Big Water.” Depending on the water level there are between 150 and 300 individual cascades of water including the largest fall, Garganta do Diablo, or“Devil’s Throat,” where about half of the river’s flow falls more than 250 feet to the base. In addition to seeing the falls from both sides of the border, the group will also take a boat ride up the river to the base of the falls and visit a hydroelectric dam in Brazil that creates about 25% of the electricity for the country of Brazil and is the world’s largest producer of electric power. On Monday night, the group will visit the Marco das Tres Fronteiras, the location where Brazil, Argentina, and Paraguay meet. There, you’ll enjoy the sunset and have an opportunity to buy some souvenirs. The group will then depart for home Tuesday afternoon or evening, Febraury 5. 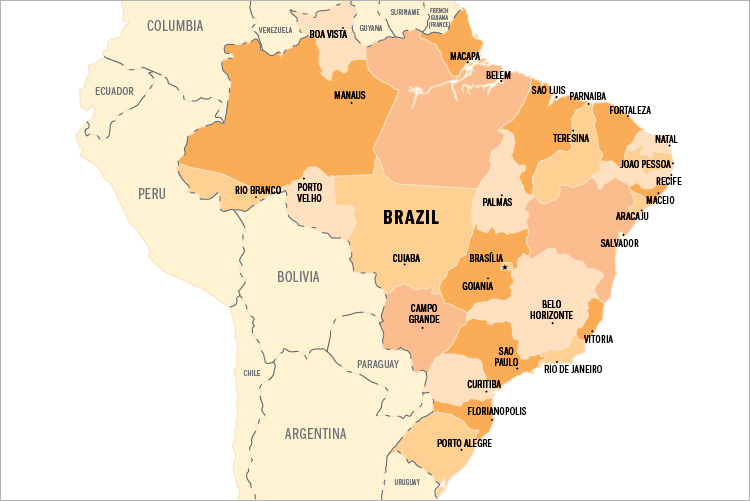 The Brazil Project has ended, please view our Volunteer Opportunities page for upcoming projects.